It’s rare we get horror anthologies these days. Until just recently the last known anthologies came out in the 1980’s with the likes of ‘Creepshow’ or the ‘Twilight Zone’ movies. Then in the 2000’s we got a few here and there with ‘Trick r’ Treat’ and ‘V/H/S’. Other than that it has been pretty dry. 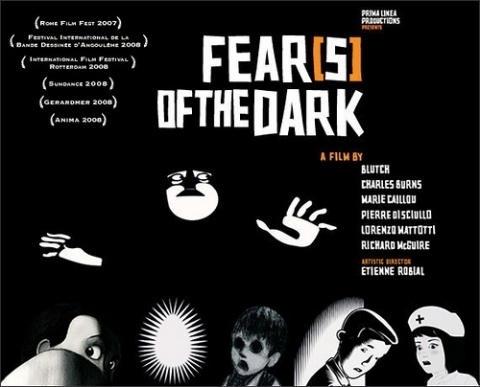 Well back in 2007 the French decided to throw one our way that was not only a horror anthology but also purely animated with traditional black and white animation. Meaning we get fully hand drawn stuff here. So not only we get a rare anthology that is French we also get one that is purely animated which to me is even rarer. And exciting. Now, I remember when ‘Fears of the Dark’ was released and I also remember how it seemed to totally go unnoticed and when it did get noticed the reviews were not favorable. Now that I run a review site I wanted to give the movie a watch and see if the reviews were fair or unwarranted. ‘Fears of the Dark’ begins with an animation of a hateful looking dog master walking his equally hateful looking dogs. The setting is obviously 18th century France and the dog master looks to be some aristocratic man out walking his dogs. His countenance is scary and the artwork is very classical and rustic which I personally found very compelling. As this man walks his dogs he comes across a little boy watching him and the dogs…he stops and looks at the boy…when suddenly he releases one of his mad hounds upon the boy. The boy instantly runs off into the country side with the dog chasing…this is where the movie then cuts to a strange cut scene filled with strange shapes and a monolog full of French existentialist ramblings. When that is all over we then get to our fist story. Flash forward to the kid’s college years and he has moved away from home but has taken his bed with him. He ends up meeting a girl and falling in love but one day the girl has a cut on her arm and then after that things begin to get weird. Needles to say…insects are not our friend. After this story concludes we then cut back to the dog master and his remaining three hounds and who he releases one on next, then another monolog then our next story which involves a Japanese school girl who has to relive her life in a dream where she tries to remember a murder she has committed. This story had some of the strangest things going on while also feeling a bit uneven. While the Dog Master animation is supposed to be the ‘wrap-around’ story this story is interrupted in the middle to cut back to the dog master and then returns to this story. Out of the four stories in the film I think this one, while a bit uneven, is a little clearer cut as to what is going on though when it concludes there isn’t any resolution? The animation is ok and relies more on strange, surreal moments which are interesting. The next story revolves around a tale about a man who revisits the countryside he used to vacation at when he was a child during summers. He recounts that one summer his uncle disappeared and that stories were going around about a creature living in the nearby swamp that was preying on the villagers. He also had a friend that seemed to know what was going on. Then one day his friend also disappeared which resulted in a large scale search which our protagonist gets lost in the swamp but seemed to have seen something very strange right before being able to find his way out of the swamp again. This story I felt was one of the stronger tales. The artwork was really nice and traditional and the story itself reminded me of a Lovecraftian style way of presenting itself. In that I mean, we have a protagonist who is recounting something from his past, a threat that is insular and personal but yet beyond our capabilities of understanding. Our last tale involves a man who is trapped in a snow storm that finds a house to take refuge in. However this house holds some secrets that are very non-male friendly. This animation does the best at incorporating the use of the Black and White artwork in how it presents its images and the story itself. My hats go off to the animators on this one because I found the way they were able to show the artwork and images with the two colors very inventive and enjoyable. The story, while not anything new was really interesting just because of how it was presented. Now as I mentioned the dog master tale was or is supposed to be the ‘wrap-around’ story. I say this based on a VERY loose interpretation of ‘wrap-around’ as there isn’t any reason behind this animation or any tie to the other stories. The V/H/S wrap around stories by comparison look like ‘Hamlet’ by comparison in terms of story. But in terms of style this animation is really intriguing and I really dug the old world style of it. On the big down side of things…I didn’t get the monolog/moving shapes segments much. I guess it is a French thing? And if they were meant to explain what the stories were about well count me out because I didn’t gain any enlightenment what so ever. Maybe they were trying for French Horror Film Art or something? I don’t know and don’t care…it was lame. Otherwise, I enjoyed ‘Fears of the Dark’ and am not really sure why it got trashed by some critics when it came out. Sometimes I feel the horror community thinks certain interpretations of the genre are ‘childish’ or not ‘cool’ and thus dismiss some things. I think such attitudes do a disservice to the genre and is not fair to people that want to contribute to the scene in new ways. If you are fan of artwork and horror stories that revolve around the art and animation I think you should check out ‘Fears of the Dark’ because it is such a rare thing to see something like this and it is something I feel should be supported more. It is very uneven in terms of quality with the second half being quite weak, not particularly engaging and forgettable, but the first half with the first two segments is terrific with original and authentic stories and very creepy and memorable imagery. 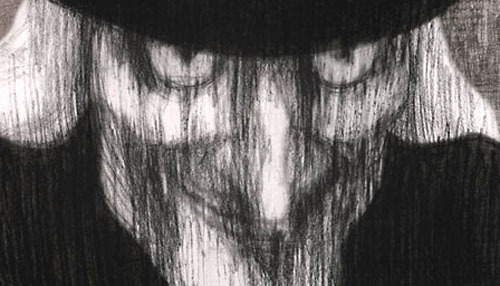 However, Fear(s) of the Dark, although very flawed, is mostly memorable for the impressive and beautiful animation with many directors each giving his contribution with his own style ranging from hand-drawn to anime to computer animation. Its second half is weak, but it largely benefits from deft editing, great directing and wonderful animation styles making it a very interesting experience. Very good synopsis David..the animation is very cool I thought while some stories may have been a little weak I still enjoyed it overall.